Michio Kaku is nothing if not optimistic. Is there anything currently in the realm of SF that we cannot do (in some fashion), eventually? Apparently not. Even perpetual motion and precognition may be possible with a better understanding of our universe (or multiverse). 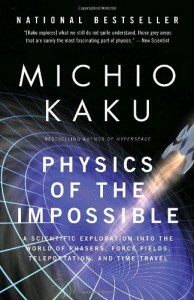 In Physics of the Impossible, Kaku, theoretical physicist and one of the developers of string theory, looks at some of the common technologies found in SF and discusses – in a very general and user-friendly way – whether or not they are possible and when they might be achieved. He divides these technologies into three categories. Class I impossibilities are advances that our current physical model can accommodate but not our current technology; however, they will be available within the next century or so. An example of this is the force field (chapter 1). The force fields of “Star Trek” or the Culture are unlikely but scientists have been experimenting with things that could produce similar results. Kaku focuses on two. The plasma window, invented by Ady Herschovitch in 1995, and magnetic levitation, which we already have in a limited way. The window is a plane of plasma shaped by electromagnetic fields. Theoretically, an envelope could be created that separates atmosphere from vacuum, useful in airlocks and certain manufacturing processes like electron beam welding. And it is possible to envision supercharged plasma windows, part of a layered defense system, vaporizing incoming objects (the other two layers would be a laser curtain and a carbon nanotube screen). We already use magnetic levitation (maglev) to move trains at high speeds. If we can develop high-temperature superconductors, we would have the capability to cheaply create powerful magnetic fields that would open the door to true flying vehicles (or even flying belts) or the floating cities of Niven’s Ringworld (though their ultimate fate might give us pause in that particular application). Class II impossibilities are also advances conceivable within our current understanding of physics but require technologies far beyond what we’re capable of and probably impossible for civilizations of less-than-interstellar scope (see NOTE below). An example of a Class II impossibility is faster-than-light (FTL) travel. In the chapter “Faster Than Light,” Kaku discusses physicists’ attempts to get around Einstein’s light-speed barrier. For example, in 1994, Miguel Alcubierre proposed a “warp drive” (see the Wiki entry) capable of producing an effect that stretched space behind a theoretical starship and contracted it before the vessel. Unfortunately, it depends upon utilizing negative matter (whose existence has yet to be proven) or negative energy (whose existence was detected as early as 1948 but which exists in such small known quantities and exerts such little force as to be useless). Worm holes offer another avenue to FTL travel but they too depend upon manipulating enormous quantities of negative matter or negative energy (Kaku points out that we would need a particle accelerator 10-light-years long to achieve the minimum energies necessary to create a usable worm hole). And even if humanity becomes capable of using such exotic material or generating such enormous energies, it’s unclear that stable worm holes could be created or that the radiation produced wouldn’t destroy anything trying to enter them. Class III impossibilities are technologies that can’t exist with our current understanding of physics and may well be truly impossible. But – and it’s a big but (sorry) – if/when we develop a better theory, even the impossible may become reality. In this category Kaku places the perpetual-motion machine, which has been pursued by charlatans as well as serious scientists for centuries (our author traces the first recorded PMM to eighth century AD Bavaria). Dark energy, though, holds out the possibility – if physicists can unravel the mystery of how much is there and where does it come from – of a technology that uses this zero-point energy to develop machines with essentially unlimited power (e.g., Iain Bank’s Culture novels). Overall, Physics of the Impossible is OK. I round up to three stars because I’m a science geek and I want to believe we are headed for the bright future Kaku imagines. I do have problems with the book. The first is purely one of content. Kaku covers a lot of ground in only a little more than 300 pages and gives short shrift to many of his topics. I found this particularly galling in the chapter on time travel (“only” a Class II impossibility according to him), where he throws out the idea that anti-matter is matter traveling backwards in time without much in the way of context. Admittedly, many of these concepts are difficult to conceptualize and notoriously difficult to analogize but I think Kaku often rushes through his explanations and falls short in making them understandable to the reader. The second problem I have with the book is a philosophical one. Somewhere in Physics of the Impossible Kaku writes of the highly advanced civilization of the future as one that has transcended fundamentalism, tribalism, racism and all the other plagues that are ravaging our world but it is unclear how this will be achieved or even why it would be achieved simply through technical advance. Nevertheless, Kaku believes that continued progress in technology and knowledge will miraculously bring this about but is unclear on the details. Considering humanity’s record so far, it’s not at all certain that it’s possible. Why should it follow that a highly advanced civilization is a highly enlightened one? Why should we be hopeful that technology will create a Utopia rather than a police state? Why should we be hopeful that a civilization that can handle 10 billion billion times more energy than ours won’t use it malevolently (at least from our point of view – I refer you to Clarke’s Childhood’s End)? Or why should we assume that technical advances will come in these particular areas? It may be that overpopulation, resource depletion and climate change will focus humans on an entirely different range of technologies, delaying further physical and cosmological exploration. And possibly precluding it since a post-industrial, post-capitalist, post-fossil fuel world may have entirely different priorities. In the end I have no real answer to my quandary. It’s terrifying to see how we treat each other and what we’re (potentially) capable of doing to ourselves and this planet with the limited technology we have. Yet…outside of resorting to the Battlestar Galactica solution (watch the series finale), it’s by mastering the technology we have and developing further innovations that we have any hope of saving ourselves and preserving an advanced society. And even then, it’ll be a crap shoot if we don’t have some concomitant advances in the areas of social and economic organization (subjects about which I have opinions as well but which fall outside of the scope of this review and of this book). Type 0: Civilizations use less than the total energy output of a planet (us, barely). Type I: Civilizations use the energy output of a planet (according to Kaku, us in another century or two). Type II: Civilizations use the energy output of a sun. Type III: Civilizations use the energy output of a galaxy. Elaborations on the theory have carried the original classifications further – Type IVs are intergalactic in nature and Type V civilizations merrily jump from universe to universe.